Any one of these risks could disrupt the world trading system and global growth. Together, they remind us that global leadership matters. Progress is rarely rooted in conflict, although conflict is at times necessary for peace. The challenge today in a world of simmering conflict is how leaders will foster stability. Acting alone, history would suggest, has rarely worked. We should applaud. And also watch carefully five geopolitical risks that could throw us off track in 2018 – and perhaps even change the global order. North Korea declared itself a “complete” nuclear state after its Hwasong-15 missile demonstrated on November 28, 2017 that it flew high and far enough to reach the US. Three scenarios exist around North Korea’s nuclear status: 1) It cannot fit a nuclear warhead on a missile and still reach the US – the presumed status quo; 2) it develops intercontinental nuclear capability, and the world lives with it; or 3) war. President Trump has condemned every North Korean missile launch and decried his Secretary of State’s attempts at diplomacy. Meanwhile, North Korea inches closer to making real its “complete” nuclear status, which would render containment or war the only options. One can bet that Kim Jong-un will not emulate deposed Libyan leader Muammar Gaddafi’s path and willingly surrender his deterrent to a first strike. The growing risk of war cries out for taking every diplomatic measure now to keep North Korea short of its nuclear goal. A necessary starting point is forging an understanding among the three potential UN Security Council vetoes: the US, China and Russia. It would take a Hwasong-15 50 seconds to reach Seoul’s 10 million people, and 25 million South Koreans are in range of conventional artillery. Time is running out to avoid war. President Xi declared at Davos in 2017 that “should we retreat into the harbour whenever we encounter a storm, we will never reach the opposite shore”. In challenging nations to share global responsibilities, he elevated tackling climate change to a global mission. Within Asia, China has usurped the US in writing the rules of trade and security. As President Trump exited the Trans-Pacific Partnership trade agreement, China invested tens of billions in its One Belt One Road initiative and the Asian Infrastructure Investment Bank, while it integrated itself with supply chains throughout Asia and championed a new trade agreement to substitute TPP. Ubiquitous economic ties reinforce China’s dominant security presence in the South China Sea. Now China may face in North Korea its greatest existential challenge on global stewardship. 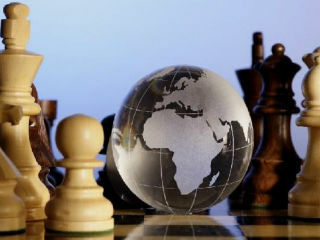 In recent decades, China claimed respect for others’ national sovereignty to avoid acting on global security threats (with the notable exception of the Iran nuclear accord). 2018 will see whether China will “retreat into the harbour” or lead diplomacy to constrain North Korea, because the risk of war is overwhelming. Running for president, Donald Trump argued that “We must as a nation be more unpredictable, starting now.” And thus has been the course of American diplomacy. A promised renewal of US-Russia relations has atrophied as Robert Mueller investigates Russia’s role in the US elections. That has rendered futile meaningful engagement with Russia on Syria, ISIS, Iran, Hezbollah that is necessary to stabilise simmering conflicts. The US decision to move its embassy in Israel to Jerusalem likely eviscerated efforts to broker an Israeli-Palestinian accord. Cold shoulders toward Angela Merkel and Theresa May have distanced NATO Allies. Rejection of the Paris Accord surprised few but evoked opposition from even the US energy industry. China’s President Xi Jinping has gladly moved to fill the rostrum for global stewardship. President Trump’s December 2017 National Security Strategy promises “a world of strong, sovereign, and independent nations, each with its own cultures and dreams, thriving side-by-side”, testing the premise that predominant US military strength will foster global stability. In contrast, a reportedly hollowed US State Department, has arguably weakened US diplomatic capacity to engage and mitigate conflicts. This void of a major superpower driving global diplomacy is 2018’s newest risk to stability. In 2017, military power – orchestrated by Iraq, Iran, Kurdish militias, Hezbollah, Russia, Turkey, and the US – stripped ISIS of its caliphate but not its claim on terror. The region teeters on instability. Sunni states see Iran encircling them in Iraq, Syria, Lebanon (through Hezbollah), and Yemen. Saudi Arabia, UAE, Egypt and Bahrain continue in a standoff against Qatar. Russia has entrenched itself through military force and oil diplomacy as the one player with influence in Damascus, Tehran, Riyadh, and Israel, yet not with enough power to broker sustainable solutions without the US – and vice versa. Meanwhile, Saudi Arabia and UAE have launched ever-crucial reforms to diversify their economies – while balancing profound social and institutional challenges that could destabilise any business undergoing comparable change. Syria could collapse as a state. A proxy war in Yemen could devastate further the region’s poorest country – and drain the pockets of the backers. Iraq could become an ISIS terror zone. The US could collapse the Iran nuclear accord to punish Iran’s regional meddling. 2018 will test whether any nation has the appetite or capacity to stop a spiral toward greater instability and conflict. Could “XXXXXX-First” become the new norm of global politics? Brexit will be the first Western test of nationalist gain versus transnational order. President Trump made America-first official doctrine in his inaugural address. Germany, France, Netherlands, and Austria all faced nationalist movements in recent elections. Some would argue that President Vladimir Putin gave shape to modern nationalism, capturing the raw sentiments of the Russian people. One consequence of this inward trend: failure to share global responsibility for over 65 million people forced from their homes, what UNHCR calls the highest levels of displacement on record. Trade agreements are under threat in North America and Korea, even as the latter faces an existential threat. Could strong growth in 2018, rooted in long-calibrated monetary and fiscal strategies and global trade, unintentionally foster perceptions of populist success? If populism eventually fails, could fear and anger engender more populist nationalism while nations ignore deeper causes of why workers fear the future? 2018 could insidiously reshape the direction of global order and begin to re-test the limits of nationalist strategies discarded almost a century ago.